when the science relates to important societal issues that have become the subject of public controversy—such as climate change, vaccines, hydraulic fracturing, and genetically modified organisms, among many others. The Division of Behavioral and Social Sciences and Education convened a diverse panel of scientists and science communicators to offer a research agenda that can inform efforts to communicate about science effectively, particularly when the issues are contentious. 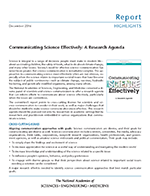 The committee’s report points to cross-cutting themes for scientists and science communicators to consider in their work, as well as major challenges that should be studied to make science communication more effective. 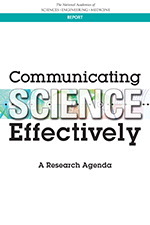 This research agenda should be pursued not only by researchers in academic settings but by researchers and practitioners embedded in various organizations that communicate science. Sponsors: Burroughs Wellcome Fund; David and Lucile Packard Foundation; Gordon and Betty Moore Foundation; Rita Allen Foundation (via ClimateCentral); William and Flora Hewlett Foundation. Members of the committee discussed the report's conclusions and recommendations.